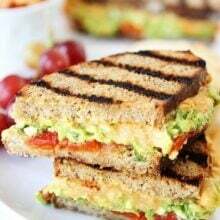 One of my all-time favorite sandwiches is my Chickpea & Avocado Salad Sandwich. If you haven’t tried it, please add it to your “to do” list right now. It is such a great sandwich. I wanted to make it yesterday for lunch, but we didn’t have any avocados so I decided to switch things up a bit. I created a new smashed chickpea sandwich, a Smashed Chickpea Greek Salad Sandwich. It has all of the flavors of the traditional Greek salad and boy oh boy is it good! I am not a mayo fan, so I usually shy away from the traditional salad sandwiches. These smashed chickpea sandwiches are all kinds of awesome though and there is no mayo involved! 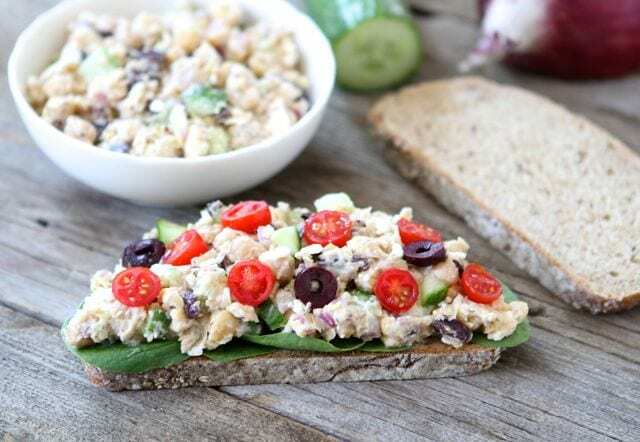 For this Smashed Chickpea Greek Salad Sandwich, I smashed chickpeas with Greek yogurt, feta cheese, a splash of lemon juice and red wine vinegar. 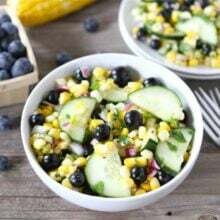 I added in kalamata olives, red onion, oregano, and cucumbers for crunch. I placed fresh spinach leaves on a slice of whole wheat bread and spread the Chickpea Greek Salad on top. I finished the sandwich with grape tomatoes and another slice of whole wheat bread. I cut the sandwich in half, thinking that I would only eat half for lunch, but it was so good I devoured the entire sammy! I loved all of the flavors and textures of this sandwich. It is a new favorite! I have some of the Chickpea Greek Salad filing leftover and I think I will eat it with pita chips today. It would also be good stuffed into a pita pocket. 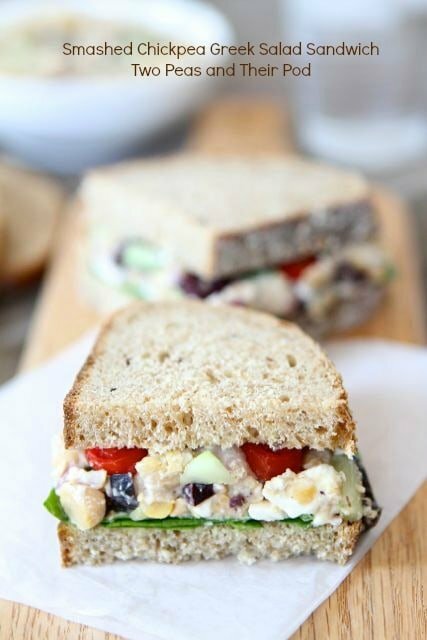 I might have to make this Smashed Chickpea Greek Salad Sandwich every day! I love it and I think you will too! This easy vegetarian smashed chickpea sandwich has all of the flavors of traditional Greek Salad, but in salad sandwich form. 1. Rinse and drain the chickpeas. Place on a paper towel and remove the outer skins. They come off easily by rolling them around on the paper towel. You can leave them on, but I like to remove them. 2. In a medium bowl, using a fork or potato masher smash the chickpeas, Greek yogurt, and feta cheese together. Add in the lemon juice, red wine vinegar, red onion, kalamata olives, cucumber, and oregano. Mix until combined. Season with salt and pepper, to taste. 3. 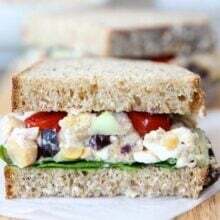 Spread chickpea salad on bread and top with your favorite sandwich toppings. I like to add fresh spinach leaves and tomatoes. The filling will make 3-4 sandwiches, depending on how thick you layer it on and how big your bread is. Enjoy! Note: You can also eat this salad with pita chips or crackers. It is also good inside of a pita pocket. Serve with gluten-free bread or crackers, if you are eating gluten-free. I am so loving this sandwich!! It looks so easy and fantastic! Perfect for lunch today! Thank you!! Looks delicious! I love your avocado sandwich and I love Greek salad. Definitely will be trying this for lunch soon. Love how colorful this sandwich is!! What a brilliant idea, and it’s so appetizing looking. The Greek salad has always been my favorite, but what could be better than putting two pieces of bread around it! 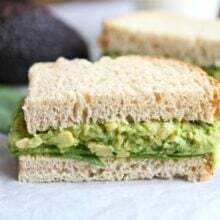 I make a batch of your smashed avacado/chick pea spread almost every Sunday for my workday sandwiches and love it! Now this Sunday I will be changing it up thanks to this recipe. 🙂 Thank you! I’m not a mayo girl either! I love subbing in Greek yogurt. This is a great vegetarian meal idea. So. In. Love. And. Lust. This looks so terrific! 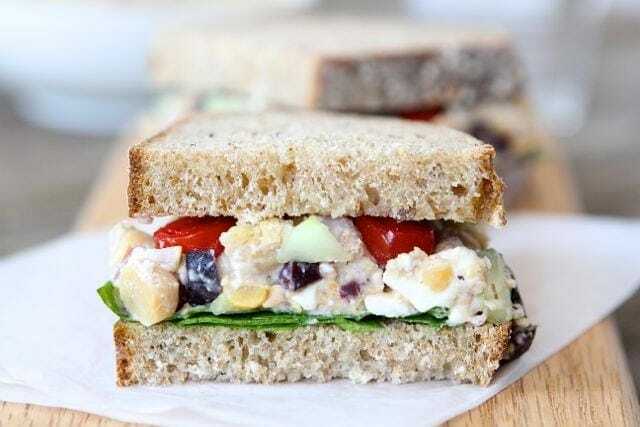 I thought I was being oh-so inventive last spring when I served curried chicken salad sandwiches to some guests for lunch and substituted chickpeas for the chicken in my sandwich. BUT … I didn’t think to smash them, and it was quite awkward to eat! 🙂 So I made a mental note to mush them up a little next time, and now I’m seeing smashed chickpea sandwiches all over! So smart. Sandwich options for vegetarians can be limited so I’m loving, loving, loving these. So great, Maria! I have been using Greek yogurt in all kinds of “salad” sandwiches and adore it. Love these flavors! Looking forward to trying this one too! LOVE this idea. You rule. Time to cook chickpeas. You just made me hungry 🙂 We’re going grocery shopping today and I’l be sure to add these ingredients to the list! I am not a fan of mayo either, I love using greek yogurt in its place. What a great sandwich! I love the fresh flavors of this sandwich! This is right up my alley. Awesome! Sounds like a healthy yummy recipe. Love the idea and how you add greek yogurt vs. mayo. Awesome! Mmm, smashed chickpeas. I love vegetarian sandwiches. They always have so much more character. I love the smashed chickpea and avacado salad (have some in the fridge right now) and know I will love this too! Thank you! This is so similar to what I just had for lunch! I combined 2 leftover salads: a couscous & chickpea salad as well as a cucumber, olive & feta salad! It was great, and I bet it would be even tastier on a sandwich! This sounds lovely! What a fun sandwich! Oh my gosh, this looks so fresh and yummy!! What a great idea! Looks delicious and light! This looks great , my husband will love this! I absolutely love this idea Maria! Last night we went out for dinner and I had this great marinated chickpea and farro salad and now I am craving chickpeas that much more, so this salad must be made soon! I love this variation of the sandwich! Love love love how healthy it looks!!! That looks amazing! I am going to have to make one soon. Smashed chickpeas are so great in sandwiches. Thanks for posting the recipe! Yum! Can’t wait to try this! Perfect for workday lunches. Just made this for lunch–delicious!!! its such a great idea for salad. I love all the Greek ingredients.. I made this and boy-0-boy was it good!! Thanks for another awesome recipe!! Ah, this was so good! My new favorite meal! I ate it on whole wheat bread, as recommended, but plan to try it in a wrap and on top of a bed of greens. Next time I might add some artichokes, too. My favorite meal too! Glad you liked it! I made this recipe today, and all I can say is WOW! It is so delicious, fresh tasting and addicting! Thanks for sharing it. I will be passing this one along to all who will listen. Keep up the good work. your recipes are wonderful. I just really miss nutritional values.